Only a couple of millimeters divided Marco Maronese and Bardiani-CSF from the win at 2017 Tour of Hainan. 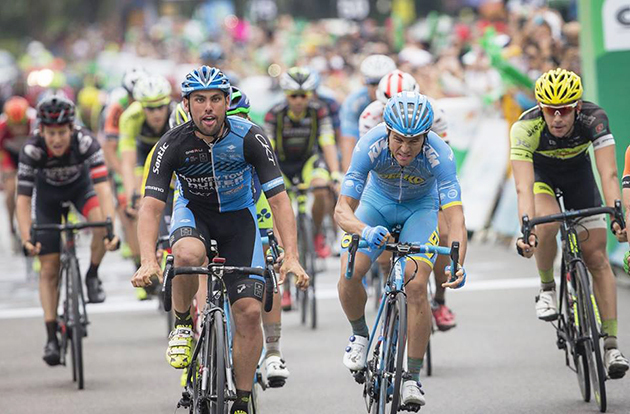 In eighth and penultimate stage, 197 km from Wuzhishan to Liangshui, the young Italian rider placed second in a tightened sprint with Zanotti (Monkey Town), the winner, and Liepins (Delko-Marseille). “I can’t hide my disappointment because I saw my first win as pro-rider vanishing for nothing. Congrats to Zanotti, who recovered in a great way” said Maronese. “Second place is not disgraceful, of course, but the win would be the cherry on the cake of a great team work. Together with Maestri and Zardini I stayed in the heading the group when, on the first climb after few kms, the peloton broke. I stayed strong because I knew Mareczko was in the second group. Mirco and Edo did a great job in the break and put me in pole position to sprint. I did my best, I didn’t gave up until I passed the finish line, then Zanotti appeared… Tomorrow should be another sprint, let’s play our last chance in the best way”. Today’s podium is the second for Maronese in Hainan after the third place achieved two days ago in Sanya. Three other top ten placements (6th, 7th and 9th) complete its palmares so far. Tomorrow the ninth and last stage of the race, 154 km from Liangshui to Wanning Xinglong. Quick-Step Floors' CEO Patrick Lefevere looks with confidence to the future after drawing a line under a fantastic season, which saw the team celebrate 59 wins. I don't believe in miracles. I often say this to the riders. What I believe in is a combination of good work from all the people in and around the team – each rider knows and takes his responsibility – a great team spirit and an insatiable hunger for winning cycling races. For years now, this combination has yielded us the success we have enjoyed. It is no secret, I want to win cycling races, and in one way or another I have been able to let this mentality seep through the whole team without many words. The fact that we are the winningest team for six years in a row has also a lot to do with choices. It is obvious that when you have guys like Gaviria and Kittel, who together have won 28 races this season, you have a good head start. I always believed in sprinters and if you build a squad around a sprinter, why not take the fastest one? If you look at a cycling team as a business, hiring the fastest sprinter will of course be an investment but you are almost guaranteed a great return on it. Of course, you can never fully hedge against incidents like illness, crashes or injuries, but most of the time, if you have a good sprinter with a good team around him, you can win races. This year has been fantastic. If we should bottle this season into a wine it would be something like a grand cru classé exceptionnel. In total, we won 59 times this year, including five stages in each Grand Tour – six in the Vuelta – 30 World Tour races, one of them being a Monument – Ronde van Vlaanderen – several stages across different World Tour events and 56 UCI races. That is important, the quality of the races we win. Quantity comes under the form of the 59 victories, but the quality is equally impressive. The Ronde van Vlaanderen victory was something special. When Philippe called me last year, asking to join the team to get the chance to complete his palmares, he had three finish lines on his list: Sanremo, Flanders and Roubaix. He believed in us, he believed that this team could help him accomplish his goals. Of course, all cyclists have major egos but I was convinced that we could do it together and we found a very good agreement, for both parties. I remember people in cycling thought I was a bit foolish, to take in an old horse but even old horses can become young again. This is what happened with Philippe when he got the right team around him and became part of the team spirit we have here. A character like Philippe's thrives in a team like ours, an aggressive team. Setting up an attack 100 kilometers from the finish on Muur-Kapelmuur at this year's Tour of Flanders was in the eyes of many a harakiri but our aggressive mentality landed the win, for us and Philippe. We say goodbye to a lot of good riders and nice guys, many of whom have been around and contributed to the team for years, but on the other hand we welcome a lot of new great riders. I always invested a lot of money in young people, I set up the development team Klein Constantia and we were probably one of the first teams to ever work with a full-time scout, Matxin, who did a hell of a job. It translated into the signing of several young riders from the U23 rankings to the top level, and, you know, these young riders are the next champions. Of course, signing with young riders is also a matter of budget but I sincerely believe in young people, I always did and always will. Obviously, it will be difficult to fight for victory in the biggest races with them but fortunately we can fall back on riders like Niki Terpstra, Zdenek Stybar and Philippe Gilbert. We also have guys in their mid-20s, like Yves Lampaert and Julian Alaphilippe, who are knocking on the door and will progress even further in the next years, and of course Fernando Gaviria, who showed us he knows how to win cycling races despite his young age. We have a Belgium flag, it's our roots since the inauguration of the team, but I have always believed in a mix of nationalities. Not only for sportive reasons but also with an eye for our sponsors' interests and businesses, which heavily build on export to different countries. As a team, which this year was made up of 13 different nationalities, we try to support our sponsors by displaying their colours and getting great results in countries and races that are of special interest to them. People who follow us or know just little about cycling will also know that our core strength since our inception has been the Classics. However, in the past years, we have made a switch in the team from being a Classics-focused team to a team that makes results in about every race there is, from the Classics to Grand Tours and World Tour races, be it stage race or one-day race. It has been a matter of choice. In the past, I wasn't interested in investing in a GC contender for the Grand Tours because you end up blowing the team apart if something goes wrong with that rider. I still try not to put my eggs in one basket but today we can win in every race we participate. Winning from January to October, in the very first and last race we did, with 14 different riders, says a lot about this team, and next year we will strive for even greater results. Elise Delzenne (28) has retired from cycling. After the World Championships in Bergen she rode her last laps on the track at the European Championships in Berlin. Two years ago Elise chose to come to Lotto Soudal after she had ridden one season for Specialized – lululemon and one year for Velocio – Sram. Before, Elise had studied to become a textile engineer and since this week she has started her new job. During her pro career Elise Delzenne conquered six national titles on the track, in 2013 she became French road champion. In 2015 Elise won Dwars door de Westhoek and the fifth stage of the Czech stage race Gracia Orlová. Last year she won the overall classification of the Trophée d’Or after she had been the fastest in the time trial on day one. This season Elise conquered the victory in the second stage of Festival Elsy Jacobs. She won gold in the scratch race, silver in the individual pursuit and bronze in the team pursuit at the World Cup in Glasgow last year. Two years ago Elise was vice-European champion individual pursuit and points race. Elise also had her share of bad luck during her career. Last year she fractured her pelvis and two flat tyres prevented her from winning a second national road title in the elite category.